Can you UpdraftPlus send you a copy of my backup set? Can you UpdraftPlus send you a copy of my backup set? Please can you (Mr. UpdraftPlus) send me (A. Customer) a copy of my backup set? Thanks! We can’t do this, because we have never had any copies of your backups (unless you paid for and set up access to UpdraftVault storage – in which case you should go to your UpdraftVault page in your account, or fill in our customer support form, with your order number). 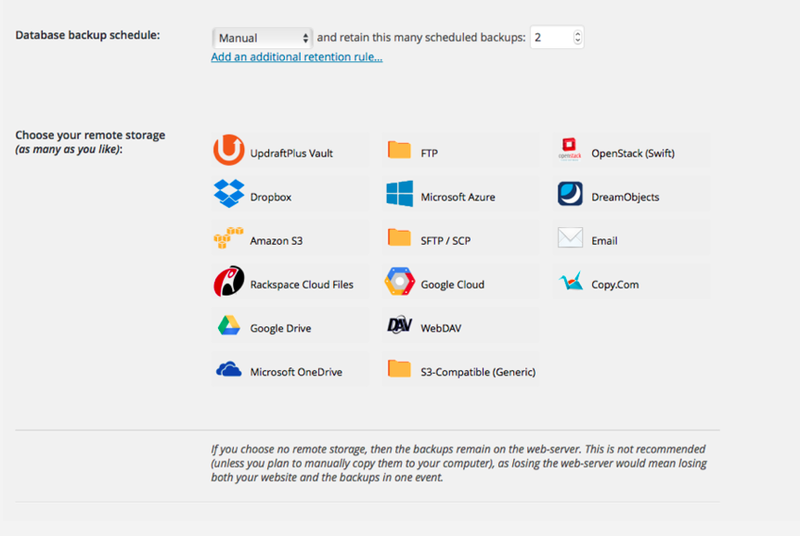 If you chose no backup destination, then (as it says in the settings area, in the screenshot above) your backups are kept on your web server. This means that they are in the directory wp-content/updraft . We don’t recommend doing this, as then if hackers destroy your website or your web hosting company goes bust, then you lose both the site and the backups in one go. This is why UpdraftPlus shows you a warning if you select that option. In that case, you can get them via FTP, or from your web hosting company’s control panel, or by requesting from your web hosting company (we don’t have access to your web hosting company, so it’s them you’d need to talk to).